Hungarian tennis player Vanda Lukacs, No. 580 in the WTA singles rankings, practised in our club before going to play at two ITF events in Italy in October. According to her own words, she was satisfied with the preparations and results suggest no difference. Reaching the singles semi-final at one of the tournaments and won both singles and doubles title at the other tournament. Vanda Lukacs is 22 years old and before joining LOVE 4 TENNIS academy, Peter Kisantal used to be her coach – former coach of Erik Csarnakovics. “I met her at one 10K tournament in Turkey. Afterwards she spoke to Filip Havaj, who comes to play sparing in our academy and travels a lot with WTA players, including Rybarikova orSafarova. When he is not here, we play with players. Jan Stancik and Peter Jurik also spent time with her. She was here three times, she has her physical coach in Budapest. She does good warm up here, stretching and of course played tennis and needs good recovery sessions,” told us head coach of the academy Erik Csarnakovics. There were first changes to her game in the academy. 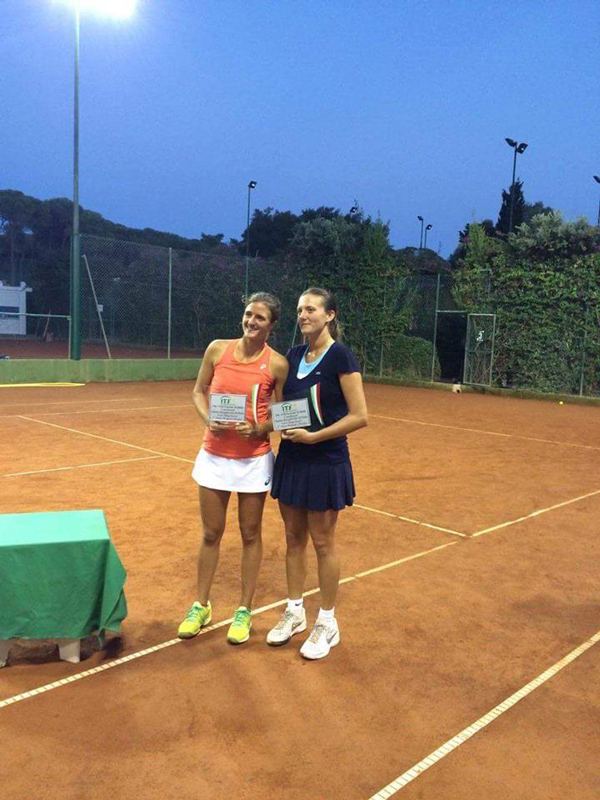 Vanda Lukacs immediately grabbed her first ever singles title at the 10K tournament in Italian town Santa Margherita Di Pula. “She is a player who knows what she wants. However she did not go the right direction. She needed someone to show her the way. Her game was chaotic. We moved her game closer to the baseline but also inside the court. We urge her to play aggressively. She serves well, has good forehand, backhand, solid returns. She has number of weapons – it would be a pity not to use them. We build her game on her active approach to beat her opponents with fast game. Before she used to fight a lot, played lifted balls, played with variety, despite the fast, she is not very agile,” named all the aspects of her preparations in the academy head coach Csarnakovics. According to him, Lukacsova has the potential to get into TOP 100. “She has such ambitions. She is perspective, her game until now is not acceptible. If she wanted to play leagues, yes it would be ok, but she wants more. Results showed we are on the right track. Now it will be much easier to work with her, because she will be more convinced. She believes in our work and she learns quickly. Her practice sessions really suggest top 100,” added coach. Doubles winners in Italian Santa Margherita Di Pula, Vanda Lukacs (right) and her Italian doubles partner Camilla Rosatell after winning the trophy.